With HALCON 13 came the new Remote Debugging feature for the HDevEngine. This article describes how the Remote Debugging feature can be used in practice. 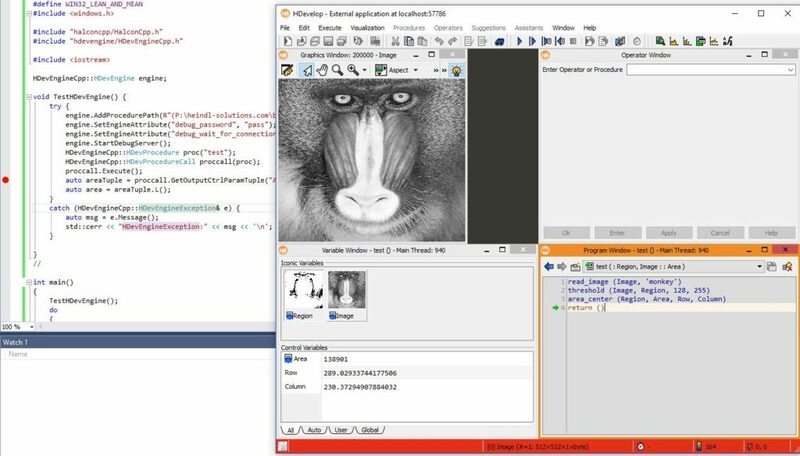 The example creates a new C++ console application from scratch. With this description, it should be easily possible to incorporate the remote debugging into your existing C++ application, too. I used Microsoft Visual Studio 2015 Community Edition. As HALCON 13 is brand-new, maybe you have opted to keep HALCON 12 as the main HALCON version during installation of HALCON 13. If you did - like me - you have to take care to set all of the following settings so that your test application does not e.g. use headers during development from HALCON 12 and libraries during runtime from HALCON 13. In Solution Explorer, right click on the project "TestDebugging" and select Properties in the context menu. Make sure you have selected the same platform in this dialog (e.g. x64) as in the run configuration (as seen in the Visual Studio main window toolbar). Make sure to uncheck "Inherit from parent or project defaults" so that definitely no old library from HALCON 12 will be loaded when running your application. You can remove the stdfx.h and stdfx.cpp files from your project if you do not use the precompiled headers option. Switch back to Visual Studio, leaving HDevelop open. Build your project (press F7) and start debugging your application in Visual Studio (press F5). When running for the first time, you will have to "Allow access" when the dialog box "Windows Firewall has blocked some features of this app" appears. until you attach HDevelop. Attaching HDevelop for remote debugging is a simple as going back to HDevelop and selecting the menu entry Execute / Attach to process... . The default setting for host (localhost) and Port (57786) should work well. Press OK. Then enter your password and confirm. You will now be in remote debugging mode in HDevelop. A red indication at the bottom of the screen will appear. You can now inspect the variables of your remote HDevEngine and run the script, even line by line. When execution reaches the return () statement, your C++ application will continue to run. 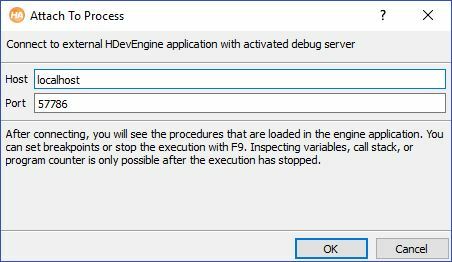 Unfortunatelly, HDevelop cannot attach automatically to the debugged process as soon as the the debugging server is available. This would be very convenient. I have written a little Visual Basic Scripting program to listen for a HDevEngine debugging server at port 57786. If this port is listening and there is an open HDevelop process, this HDevelop will be triggered to attach to this port and start debugging.
' will be triggered to attach to this port and start debugging. strCommand = "cmd /C ""netstat -an |findstr "":57786. *LISTENING"" >" + tempFile + """"
Heindl Solutions is your MVTec Certified Integration Partner. We create HALCON machine vision solutions and complete GUI applications. Ask us about tailor-made solutions for your requirements.